During the bullish market period of 03/14/03 to 01/23/04, MAPS yielded interesting results as shown in the table below. 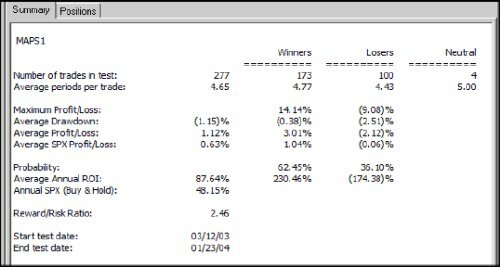 MAPS back-testing showed 62% winning trades during this period with the average winner gaining 3% and the average losing trade losing 2%. More information on this strategy can be found in your TradingExpert Strategies folder. As with any investment strategy, past performance does not guarantee future results.